I gave them name tags because all Greek philosophers look alike. I don't mean that in a racist way...I mean it in a prejudice-against-philosophers way. Diogenes was knee deep in a stream washing vegetables. Coming up to him, Plato said, "My good Diogenes, if you knew how to pay court to kings, you wouldn't have to wash vegetables." "And," replied Diogenes, "If you knew how to wash vegetables, you wouldn't have to pay court to kings." 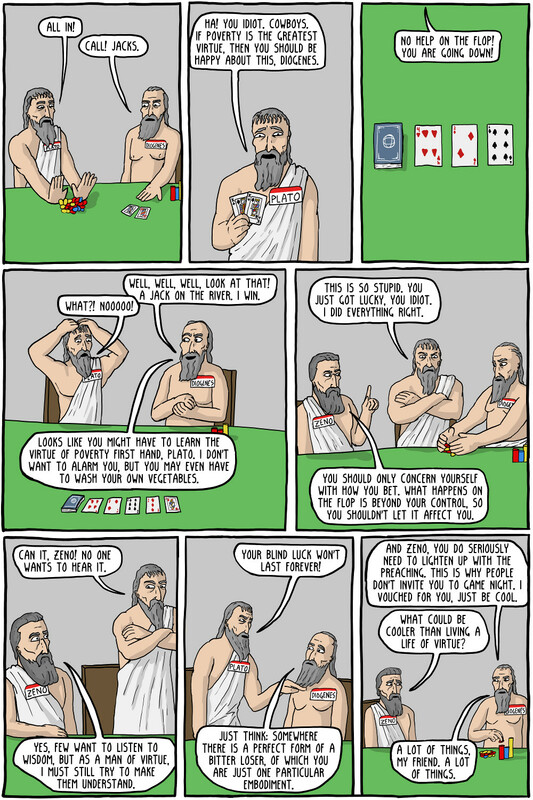 Plato was discoursing on his theory of ideas and, pointing to the cups on the table before him, said while there are many cups in the world, there is only one 'idea' of a cup, and this cupness precedes the existence of all particular cups. "I can see the cup on the table," interrupted Diogenes, "but I can't see the 'cupness'". "That's because you have the eyes to see the cup," said Plato, "but", tapping his head with his forefinger, "you don't have the intellect with which to comprehend 'cupness'." 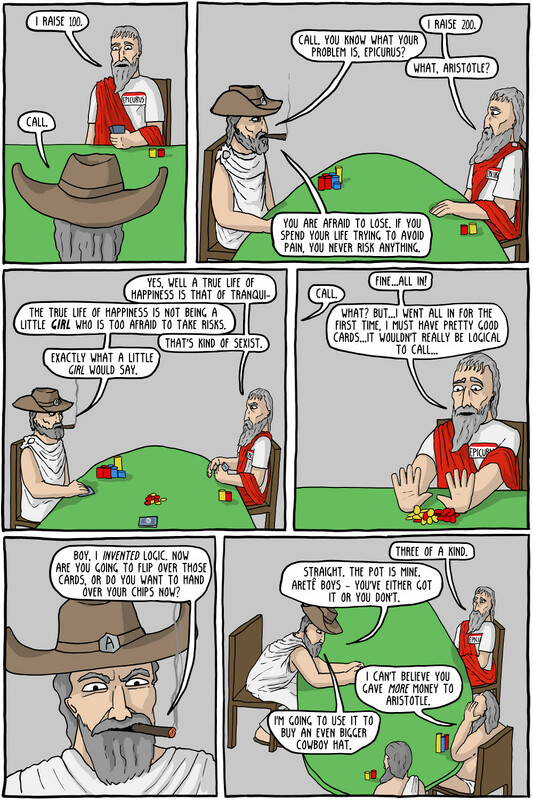 Diogenes walked up to the table, examined a cup and, looking inside, asked, "Is it empty?" "Where is the 'emptiness' which precedes this empty cup?" asked Diogenes. Plato allowed himself a few moments to collect his thoughts, but Diogenes reached over and, tapping Plato's head with his finger, said "I think you will find here is the 'emptiness'." Epicurus was an ancient philosopher who believed that happiness was the only good in life. Unlike the modern term "epicurean", he generally thought this was achieved by living a simple life, and avoiding pain and displeasure. Aristotle's character doesn't have a whole lot to do with his thought, but he believe the best thing in life was to work towards "Aretê", a Greek word meaning loosely "excellence". He also wrote some notoriously sexist things.